Younger readers may think of the series in recent years as being all about making friends with orcs, or for those with slightly longer memories about under-appreciated RTS games and cancelled epics. But Tolkien’s influence on video games stretches much further back. Fans have been playing games based on The Lord of the Rings (and The Hobbit) for almost as long as there have been video games, and for every misguided flop there has been a game that has been surprisingly OK for a licensed product. And in some cases much better than that. 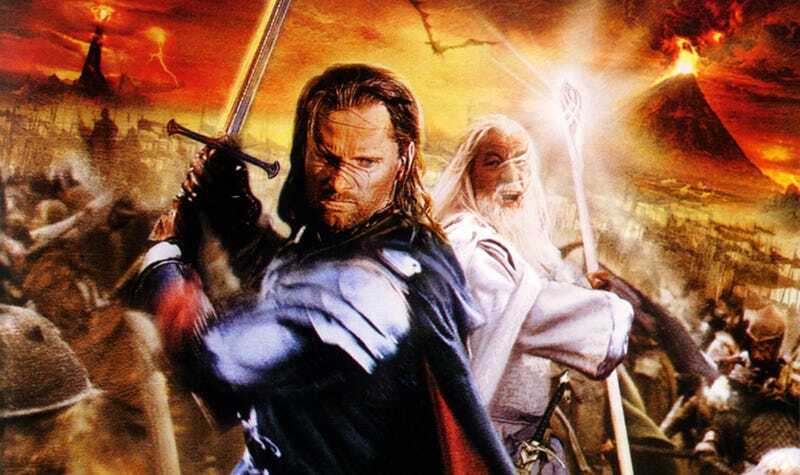 Australian studio Beam Software made a number of LotR games, but their first remains the most important. The Hobbit, released in 1982, is an absolute adventure game classic that helped push the genre forwards in a number of ways, from its inclusion of illustrations to a complex text-entry system that let users string together long sentences (instead of just typing “open door”). It even had a primitive physics system. The second of EA’s brawlers based on Peter Jackson’s film trilogy was the better game. It married a competent action system with fantastic recreations of the movie’s key scenes, and (for the time) had some incredible voice acting, including appearances by key actors like Ian McKellan and John Rhys Davies. It was also one of the best-looking games of 2003. Yes, I mean it. This game has one of the dumbest boss battles of all time, but that tends to overshadow everything that came before it. This is one of the best Final Fantasy clones around, even if it is a bit simpler, and its alternate telling of the saga is one that still feels at home within Jackson’s take on the novels. And like most of EA’s other Lord of the Rings game, the production values helped really sell the license and make more of an impact on fans than the game might have were it to have been set in some random other universe (with more zippers). The massive battle scenes of Lord of the Rings were always going to lead to strategy games, but the question was how those were ever going to stretched out over entire singleplayer campaigns. EA found the answer in using hero units to let players act out smaller moments from the trilogy, while still allowing the scale to fight battles like Helm’s Deep. Both BFME games are good, but the second might be slightly better thanks to a campaign that didn’t have to skew as closely to the main storyline, and could thus engineer some better mission design. By far the better of WB’s two Lord of the Rings games (to date), Shadow’s focus is much tighter, its nemesis system more refined. I’m not the biggest fan of WB’s take on the license—it feels more like its own IP dressed in a veneer of Lord of the Rings—but the thrill of its stealth murder and orc friendship system makes up for this. This is a mod, not a standalone game, so I couldn’t officially include it on the list. But here’s a shout out for it anyway, because nothing has ever captured the scale and fury of the series’ biggest battles like this Total War conversion, which transforms Medieval: Total War 2 into the ultimate Middle Earth combat experience.